We've seen the pictures and now it's time to get a glimpse of the 2015 F1 challengers in action as pre-season testing gets underway. Jerez plays host to the first four days of testing, with eight of the nine teams expected to participate in some fashion. Force India have confirmed they won't be present, preferring to continue to work on the car ahead of Barcelona. The rest are ready to roll, though, to see how the new-look noses function, what kind of tyres Pirelli have to offer, and how their engine developments have affected the order of the things. Ferrari lead three of the four days of testing, but Mercedes top the lap counts. Lotus delay their running until Monday after flying the new car in late, but complete 41 laps on their first day. 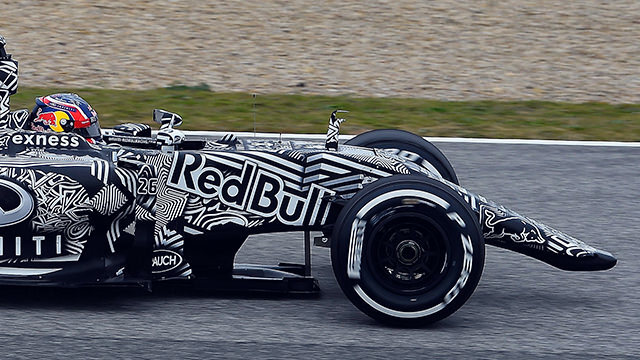 Red Bull reveal blinding black and white livery to conceal their updates. On his first day, Kvyat damages the only front wing they have and is forced to run installation laps without a front wing attached. McLaren and Honda have a difficult start, with only six laps each on the first two days. They finish the four day run with only 79 laps overall. Rain hinders team schedules on Monday with only four drivers willing to head out on track. The remaining two days have damp starts with the track drying later on. Sauber have strong pace and complete plenty of laps but aren't getting their hopes up just yet. Welcome to a special Factbyte Factbox chronicling the fate and fortune of teams as they head to Spain to get their first taste of Formula One 2015-style. Teams have been heading to Jerez all week, descending on the small circuit with their new cars, revised liveries and plenty of hopes and expectations. Toro Rosso are ready to rock and roll, launching their new car at the track before hitting the ground running tomorrow. Tweet from @JamesGallowayF1: And off we go again... a sunny but blustery Jerez awaits today's STR10 launch before testing kicks off in the morning. Force India have opted not to be at Jerez this week. They had intended on running the old car, saving the new VJM08 for Barcelona. However, the tyre data wouldn't be that useful for them, so they're saving resources by missing the first week. We'll also get to see both Sebastian Vettel and Fernando Alonso in their new colours tomorrow, as the champs make their 2015 debut for Ferrari and McLaren respectively. It's already been noted that Vettel doesn't look too comfortable in his overalls, but maybe it'll be better once he's been in the car. Jenson Button isn't scheduled to drive until the second day, but has revealed a new set of colours for his helmet. After running the pink tribute to his father for much of 2014, the colours are toned down a notch for the coming season. Toro Rosso did pull the covers off the STR10 and released an exceptionally pointy nose out into the wider world. They, as with most of the teams, say they are still developing and this isn't the finished product, though. 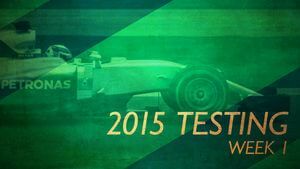 Looks like these tests are really going to matter this year, as teams ramp up development to the start of the season. It's not just about the car, these three weeks also allow drivers to get to know their cars. Sainz Jr says: "Now we have just 12 days to prepare for Melbourne, so going through all the race weekend procedures will be a priority for me, as well as putting in as many miles as possible behind the wheel." With the first day of testing comes the reveal of a couple more cars, starting with defending champions Mercedes. They pulled the covers off the F1 W06 before Nico Rosberg got behind the wheel for the first run. It's no surprise that Rosberg and Mercedes are currently topping the times, but more importantly have also completed the most laps by lunchtime - 43 already! Williams officially launched their new car, but they'd already revealed what the FW37 looked like. The nose on that one is potentially the worst we've seen so far! 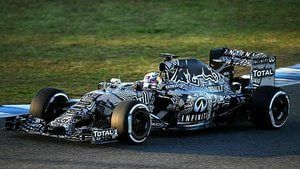 Meanwhile, Red Bull have eschewed the launch procedure by simply heading out on track in their new car, covered in a zebra-style testing livery. The eye-watering paintwork hides a lot of the developments, and is probably nicely distracting for other drivers out on track today! Lotus are slightly delayed, with the car still on the way to Jerez. Williams have been busy putting the finishing touches to the car, and have only just come out to set their first lap of the session. Bottas is behind the wheel, and it's a slow start but with plenty more to come, no doubt. Tweet from @tedkravitz: McLaren engineer-watch: Andrea Stella will be Alonso's race engineer this season but is not in Jerez pending release from Ferrari contract. The first day of testing draws to its conclusion then, and the lap times and counts are in. The times are rarely indicative of anything, given the vast array of setups and programmes the teams are running, but it's still worth a quick look. Mercedes lap count of over 150 laps on the first day is stunning. Daniel Ricciardo had a difficult first day, as the Red Bull ended its morning with smoke pouring from the back of the car. He was out again in the afternoon, though, and finished fourth overall. Fernando Alonso's six laps must be a disappointment for the Spaniard on his first day of running for the team. The engine reportedly didn't sound too healthy whilst out on track, and he spent much of the day in the garage. Regardless, he still tweeted: "First laps. So proud of my team." So he's happy, anyway. If you've only got sixty seconds to catch up with today's launch and testing action, then the F1Minute roundup should see you right. Lotus didn't quite manage to get to Jerez for day one, but the plane has landed and the car is at least in the right country now. They're not expecting to be present tomorrow either, though, saying: "The car is now undergoing its build programme overnight and through Monday, with the first significant running expected for Tuesday February 3." There's plenty of love and hate surrounding the Red Bull livery, but Daniel Ricciardo is the one who had to sit in the car all day. He doesn't mind it. "The livery’s cool. It’s a testing specification for us but I think it looks really good. Maybe I need a matching helmet." Sauber had a very quiet day, finishing up with the second fastest time. More importantly, they had no major problems. Giampaolo Dall'Ara, Head of Track Engineering was feeling positive: "The car was working well from the beginning. In the afternoon we went a bit deeper by exploring the balance and checking some different tyre compounds. We are happy that the car is working, and compared to last year we can see the improvements." Tweet from @WilliamsRacing: Rod Nelson: We have gone through our normal winter programmes today and have solved any issues. We are looking forward to tomorrow. Daniil Kvyat's first day with the Red Bull team hasn't gone particularly well. The Russian driver made contact with the barriers and broke the front wing - but it was the only front wing the team had brought to Jerez. So he's been running without the front wing. Christian Horner joked: "What I should really be telling you is that we have so much front downforce we don’t need the front wing, and we’re just trying to balance the car." Button hit the track for the first time this year, getting behind the wheel of the McLaren. Honda are still having problems, with the Brit completing just a handful of laps in the morning. Mercedes are piling in the miles for the second day in a row. This time, defending champ Lewis Hamilton is driving the car and he's completed more than 70 laps already! The good news is Lotus are ahead of schedule and Pastor Maldonado has been out in the car. Grosjean was scheduled to run today but the delayed start means Pastor gets his turn with Romain taking over tomorrow. Lap times must be taken with a bucket of salt, but Sebastian Vettel is still leading the way for Ferrari. Nico Rosberg isn't in the car today, but he's keeping a firm eye on his teammate's progress, peering out from the pit wall. Kvyat has yet to set a lap time today, he is circling the track occasionally but dives into the pit lane at the end of each lap. Presumably, without a front wing, they wouldn't be representative times anyway. Tweet from @F1_Aero: Running without a FW limits any useful aero data for RBR, wheel wake control lost, flow will be in completely different places. It started raining during the afternoon in Jerez, so there wasn't an awful lot of running to be seen. Vettel retained his fastest time from the morning, and just four drivers ventured out in the damp conditions. The final times after the second day of testing, with Ferrari still going well and Sauber surprisingly quick (for what testing times are worth). Disappointment for Red Bull and McLaren today though. Mercedes didn't quite hit the century today - Hamilton was notching up the laps quickly but then had to return to the pit lane with a water leak. Then the sky started leaking and that was the end of his day. Tweet from @JensonButton: Special feeling jumping in to my McLarenHonda today, shame it was only a few laps but that's testing. Kvyat on his slightly embarrassing day at the office: "Sometimes mistakes happen and there's nothing you can do about them. We still maximised our running with what we had and hopefully we can recover from that. I have another day to make up for it, so just looking forward to Wednesday now." Enjoy a sixty second recap of testing here, particularly regarding Honda's slow start to the year. Button really doesn't seem too phased by the whole situation, playing up the team game nicely: "There’s a very positive atmosphere about the place: the team isn’t McLaren and Honda, it’s McLaren-Honda. It’s everyone together." The third day of testing is well underway, and the good news is McLaren have managed to string together several laps! Fernando Alonso is behind the wheel today and has completed more than 30 tours of the Jerez circuit. Progress. Ferrari are still fastest so far, with Kimi Räikkönen taking over duties from Vettel. Mercedes seem a bit more focused on pace today, but have also had a couple of reliability niggles. The team say an engine shutdown caused Rosberg to stop out on track, and the car has been hauled back to the pit lane on the back of a truck. Nico's was the second red flag of the day so far, with the first coming earlier in the morning. Felipe Nasr spun his Sauber into the gravel and also had to be recovered. The drivers were running on a damp track this morning, though, with intermediate and full wet tyres spotted dotted about the pit lane. It dried up after about an hour. Despite having to play catch up after a lack of useful running yesterday, Red Bull have only managed to complete 5 laps so far. The team have been working hard on the car in the garage, with Daniel Ricciardo waiting around for much of the morning. McLaren's running came to an abrupt halt just after lunch, with the team calling it a day because: "We've had a loss of cooling water pressure & have removed the power unit for inspection. That’s a long process, so it ends today's running." The third day of testing drew to a close with Ferrari knocked from the top spot, by the ever-present Sauber. McLaren still lag behind the rest but did get a whopping 32 laps completed today, which brings their total up to 44. It seems like it was a quieter afternoon in Jerez today, with teams getting their heads down and finally getting some miles done. They've got just one day left of testing here before a break and then two weeks in Barcelona. Tweet from MercedesAMGF1: That's a wrap for @nico_rosberg @circuitodejerez! Nice touch on his in-lap radio: "Thank you everyone - really top job to start to the year." To finish the day up, there was a power cut at Jerez which put the media room into a blackout. Spooky! Felipe Massa was in the Williams for the first time today, taking over duties from Valtteri Bottas. The Brazilian was very happy with what he found waiting for him, too. "I think so many things we have improved to how we finished last season. I'm really confident that some areas of this car are already more intelligent and a better set-up to how we worked on last year's car." Kimi Räikkönen was also on duty for the first time today, wrenching the wheel of the Ferrari from Sebastian Vettel's grasp. Kimi's feeling slightly more positive about the car after just one day, but remains realistic: "It's too early to speak about results. Like I said we had a good, positive first day, and Sebastian had a good couple of days. We'll try to do our best, and I'm sure if we keep doing our work as a team we'll push forward as a team with two cars, improving things, we can get some good results." Final day of testing then, and Kimi Räikkönen is currently fastest, putting Ferrari back on top. There have been two red flags so far today, with Daniil Kvyat in the Red Bull stopping after less than an hour, and then Lewis Hamilton's Mercedes drawing to a halt mid-morning. Tweet from @MercedesAMGF1: Bit of an intermission as the car is fetched from an unusual parking spot between T11/12. Just awaiting her return now..
Tweet from @redbullracing: It looks like an ERS problem... The Team are on the case and looking to get Dany back on track soon. Both cars have, indeed, been patched up and are back in action now. McLaren and Honda have still been grappling with engine problems. Jenson Button managed just seven laps this morning, but has hit the track again and is improving quickly. Romain Grosjean has been putting the miles in, completing more than 40 laps this morning. Some of his laps have been a bit wobbly, though, as he settles in the car for his first day of work. There were just a couple more red flags before the end of the day, one for some debris that appeared out of nowhere - presumably blowing onto the track. The other came right at the end of the session, with Marcus Ericsson running out of fuel in his Sauber. Ferrari returned to the top of the timesheets for the final day of testing, with Kimi Räikkönen setting the fastest lap time of the four days. Sauber remained near the sharp end, whilst McLaren rounded out the field at the bottom... again. Kvyat had a much better day today, managing to get round without battering the front wing. Familiar name Guillaume Rocquelin was happy with their day's running as well: "A slightly frustrating morning for us, with an ERS problem. It cost us a few hours, but to be honest the track was a bit greasy again this morning so we probably didn’t lose too much meaningful running. 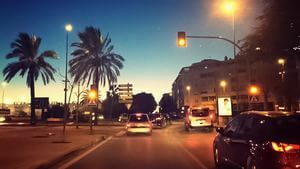 Once we’d sorted the issue the car ran perfectly all afternoon and we were able to get through the key elements of the programme we had mapped out." 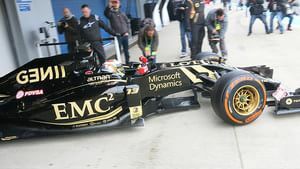 Romain Grosjean finally got his first taste of the brand new E23 after Maldonado completed two days of running. The Frenchman was, for once, satisfied with the machinery that Lotus gave him: "I completed over fifty laps today and I can honestly say that all of them were enjoyable to drive. The team has made very good progress if you consider where we were this time last year. It’s a very good start and I’m a happy driver!" How long is it since we heard him say that? A handy sixty second summary of the statistics from Jerez you need to know about, lap counts, tyre data and more. Also, a pretty stunning F1 Big Picture of Mercedes, who have had a fabulous four days of testing with only a few gremlins here and there. Kimi Räikkönen, feeling surprisingly talkative after his successful day of running: "Compared to last year, [the car is] definitely much better. Still things to work on and improve, but we have something we can work with. The team has done a good job over the winter to prepare and make this car, we can be happy about that. Still early days but not so bad." Overall, an interesting four day test then! Mercedes strong as expected, Ferrari perhaps a bit of a surprise. Slow starts for Lotus and McLaren, plenty of work still to do there. Lots still to learn and two more tests still to go! Thanks for reading over the past four days, the FBFB will be back for Barcelona on the 19th February when the second of the three tests gets underway. We might even get to see a Force India of some sort! @McLarenF1: Sundown, homeward bound. Thanks for having us, Jerez.